From the tip of the South American continent to the northernmost shores of Antarctica: here’s where you’ll find the reputed roughest sea-passage in the world. The Drake Passage is the stuff of legends crossing it is an experience passengers on Antarctica cruises look forward to the most. There’s something quite exhilarating about experiencing rolling waves aboard an ice-strengthened Antarctica expedition vessel. Keeping the piña colada from spilling becomes life’s most pivotal task. The Mar de Hoces, as the Drake Passage is known in Spanish, was first allegedly sailed in the early 1500s, when famous Spanish marine explorer Francisco de Hoces sailed south enough to see the end of the landmass that is South America. A few decades later a famous British explorer, admiral, and sea captain, by the name of Francis Drake, lost a ship to formidable southward winds whilst sailing the west coast. This confirmed to him the existence of a convergence of the Pacific and Atlantic Oceans. Drake was a legendary figure in British expansion and it is from him that the passage’s English name derives. The Spaniards, however, consider him a pirate (in their defence, Drake did have a penchant for capturing their treasure-filled ships) so most Spanish-language literature nowadays still refers to the Drake Passage by its original name. The Drake Passage stretches for just under 1,000km and is the spot where the Atlantic, Pacific, and Southern Seas converge, creating a roaring current mix that has the potential to make you regret that extra serve of pasta at supper. 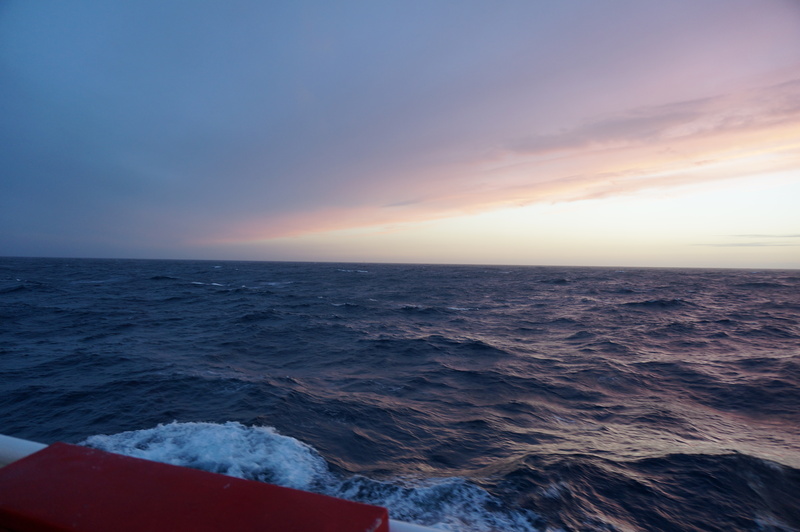 What makes the Drake Passage so infamously rough is the fact that currents at this latitude meet no resistance from any landmass, anywhere on the planet. Coupled with the area’s propensity for high wind, a crossing of the Drake Passage can be quite the adventurous exploit. Luckily, expedition vessels nowadays are equipped with stabilizers to absorb much of the swaying and most Antarctica cruise ship passengers get by with just a sea sickness tablet and a few crackers. The passage’s inherent unpredictability means that it can, at times, also be eerily calm. 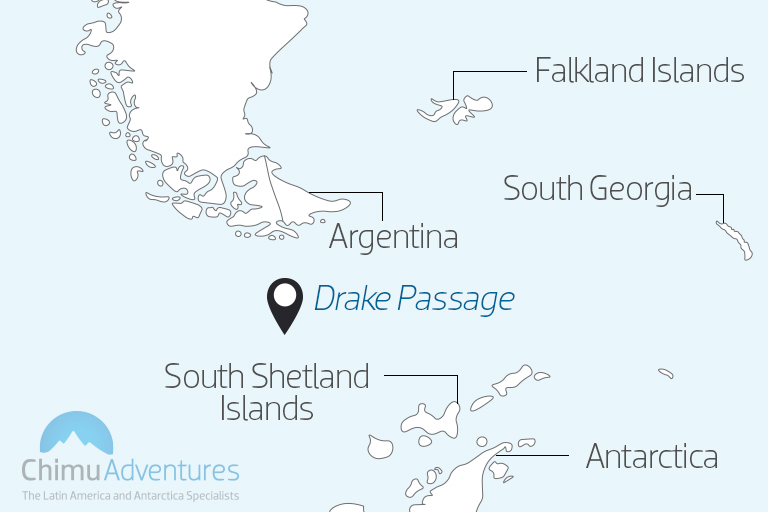 Whether you experience a Drake Shake or Drake Lake, you can trust a Drake Passage crossing to be a most definite highlight of you cruise to Antarctica. The chances for spectacular wildlife watching along the Drake are high, with hourglass dolphins, humpback whales and migrating albatross making regular appearances. Ushuaia is the gateway to Antarctica, photo credit: Shutterstock. Hop aboard your expedition ship to Antarctica and one of the first things your crew will tell you is to keep that seaside sickness medication close at hand. The Drake Passage is the only part of the cruise which has the potential to cause ship passengers any grief (or excitement, depending on the adaptability of your nerves) as once you’re Antarctica, the seas are protected and sailing is very smooth. Sometimes, the crew get cheeky and play Michael Jackson’s ‘Rock With You’ to the usually small crowd of hardy guests who prefer to uuuhh and aaahhh to every splashing wave together in the observation deck. If you’re a seasoned traveller who’s been everywhere and seen everything, a Drake Passage crossing should definitely be at the top of your must-endure list. For adventure value alone, it’s absolutely priceless! And while you’re at it, spare a thought for those poor souls who work on megaships and tankers, those too wide to fit through the Panama Canal. They have to endure a whole voyage south, and a crossing along the Drake, every time they sign up for a gig. But many state there’s fierce competition among sailors. Between the construction of the Canal and air-travel, few have the chance to experience ‘one of the most notorious sea crossing in the world’ and the Drake Passage is seen as a much coveted bucket-list experience for many. And lucky you. On an Antarctica cruise…you get to do it twice! Keep a Dramamine in your pocket and enjoy the beautiful ride. It takes two days to cross from Ushuaia to Antarctica, and this valuable time is usually spent getting acquainted with your fellow passengers and attending presentations aimed at educating you on everything Antarctica-related. From safety to history, geology, biology and all else in between. You’ll be asked to clean your outer clothing so you don’t introduce any nasties on the pristine environment and given a list of do’s and don’ts which you must follow. You’ll also savour great food and wine, and warm up with hot cocoa, all the while enjoying a truly stupendous and very exciting experience. There’s something about the slow – and yes, at times even uncomfortable – journey across the Drake Passage which is quite therapeutic. As you board your expedition ship, you won’t just be leaving Ushuaia behind, you’ll be leaving behind civilization as you know it. You’ll be heading forth towards the most desolate and spellbinding place you’ll ever see. The excitement will slowly build among your group, the expectation will rise. The first dolphins, perhaps the first whale…until it’s the first iceberg and the first sight of land. It’s a magical, breathtaking, and cathartic experience that is simply lost when one flies over instead. So hang in there! Thanks to the crossing of the Drake Passage, the remarkable fun of a trip to Antarctica starts way before you ever get there. 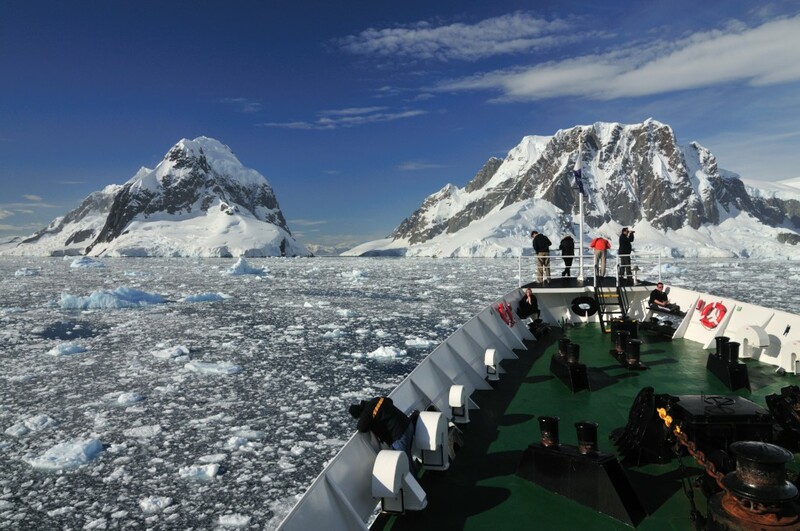 For more information on cruises to Antarctica and current special offers please visit our Antarctica page. Sailing in comfort & style aboard the Hebridean Sky, we begin this 14-night expedition at the tip of South America. We will chart a course through the Drake Passage and along the Antarctic Peninsula with the ambition of crossing the Antarctic Circle.